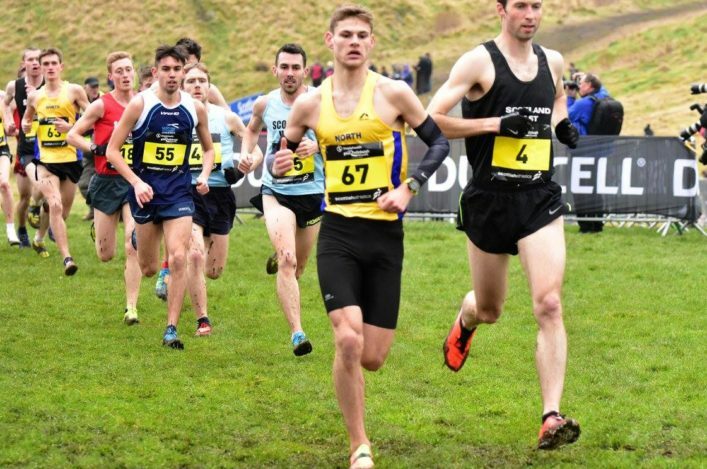 Kris Jones made it two-in-a-row in terms of the Scottish Inter-District titles as he powered to gold over the mud at Holyrood Park. The Welsh athlete who runs for Dundee Hawkhill Harriers represented the East District to repeat his 2017 success. Jones on this form could well be the hot favourite for the National XC at Falkirk next month and he revealed his Edinburgh win came despite a ‘slight cold’ earlier in the week. ‘I had a slight cold earlier in the week and what that did was make me ease off the running a wee bit,’ said Jones who won in 25.55, some 36 seconds clear of Oates. ‘I only did four miles on Wednesday and nothing on Thursday so probably I did save myself a few miles in the preparation. I felt fresh at the start and the legs were good so pretty quickly I decided just to go for it, really! The East took the team golds from Scottish Students with the West taking bronze (although guests North of England were third). Fionnuala Ross won the Scottish Women’s Inter-District title for the second time in three years with a strong run to hold off challenges from the North of England visiting athletes Abbie Donnelly and Georgia Mair. The Shettleston athlete took gold for the West and it was a 1-2 with the silver medal to Elspeth Curran of Kilbarchan AAC and the bronze for Rebecca Burns of Edinburgh AC for the East. Ross was at the Euro Cross for Ireland after fifth place in the Irish National XC champs and is hoping for selection for the World Half Marathon champs, for which she had the qualifying standard. 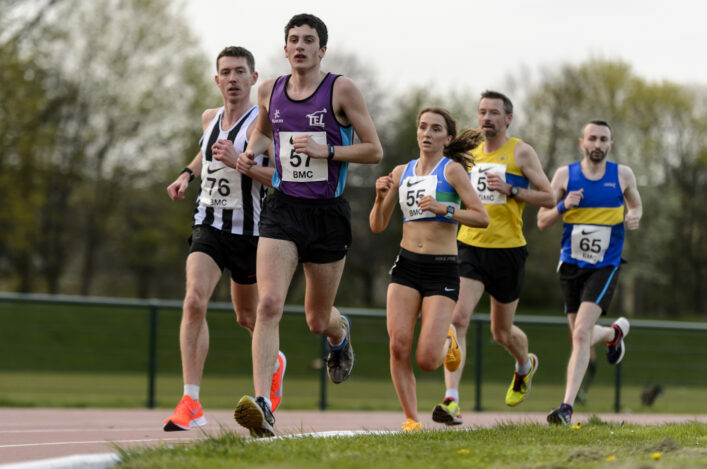 ‘I feel I am in good form and it was good to win the Inter-District title again,’ said Fionnuala, who clocked 22.27 for the 6K course. ‘I thought some of the North of England athletes would make the race even more competitive and that’s what happened. I took a lot from the Euro Cross selection – just being out in Slovakia and being at that level is a learning curve. I experienced all the preparation from being with the team and that kind of thing. East women won gold after finishing just behind the North of England, who do not count for the medals as guests. The West took silver and Scottish Students the bronze medals. 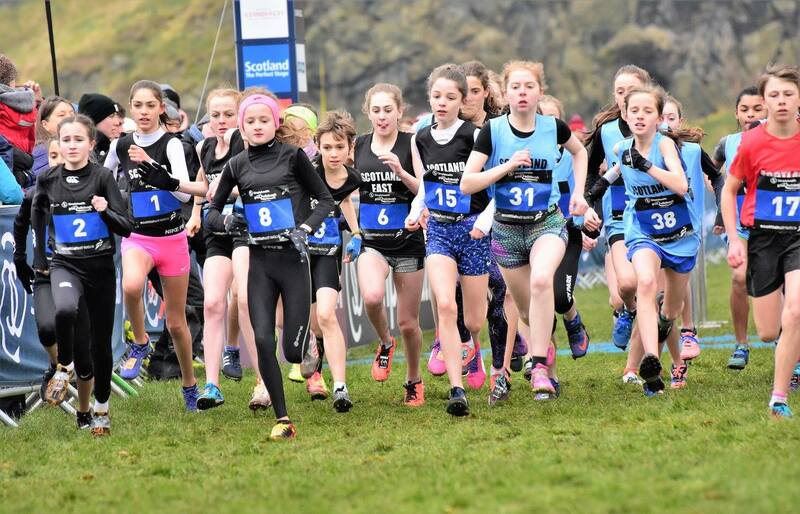 The Inter-Districts had opened up with the races at U15 level. First off were the boys and as they took on the 4K course around Holyrood Park with typical enthusiasm. 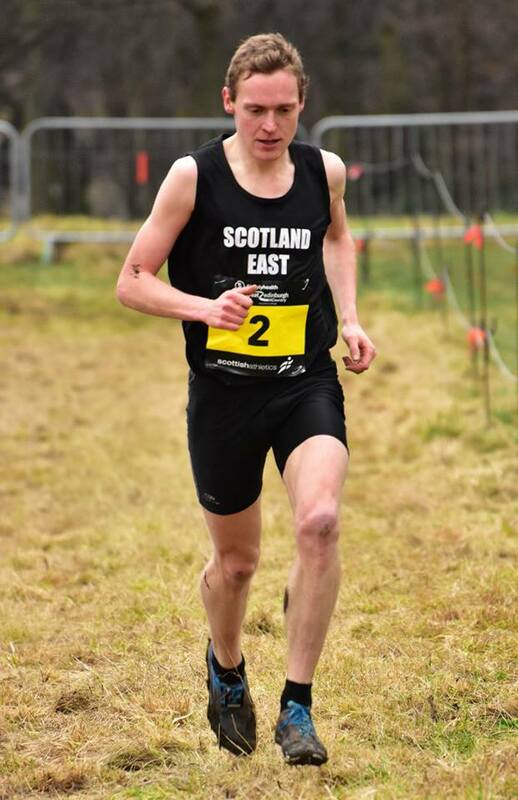 An early group of leaders was broken up and it became a battle for gold between Jack Patton of the West and David Addison from the East, with the Kilbarchan athlete taking the win by a couple of seconds. Lucas Cairns of Inverness took bronze for the North. Fife’s Anna Hedley and Anya MacLean of Garscube fought out a great battle in the U15 Girls race and it was the East athlete who took the Inter-District title. The bronze was carried off by Pippa Carcas for the East. The East girls took team gold. At U13 level, there was a gold for the East’s Katie Johnson and silver for the West’s Valencia Wright. The bronze went to Anya Morrison of the North. There were team golds for the East. Finlay Ross won the U13 Boys for the East from Ross Dewar, with the North’s Lachlan Buchanan taking third. Again, the team golds were won by the East. The U17s medals were incorporated into the Junior Men’s 6K International race. 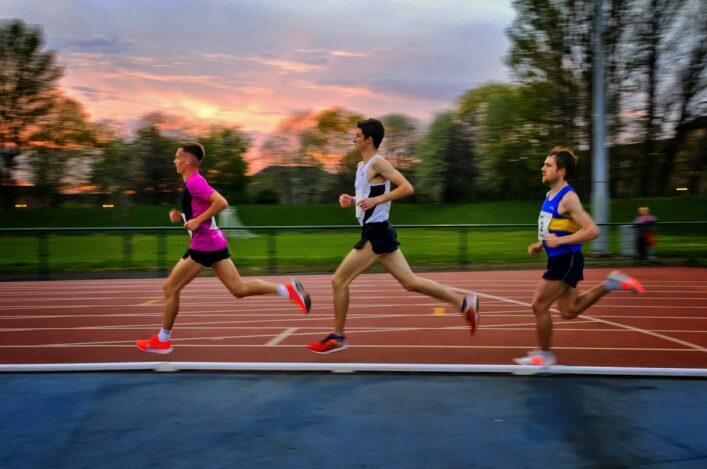 Christian Graham of Lasswade had won the Scottish U20 men’s 3000m indoor gold the week previously at the Emirates and he was just as good over the mud to take gold in 2040 to win by 19 seconds from Cameron Wright of the West. James Gillon took the bronze medal for the West. The West won the team golds from the East in second and the North in third. 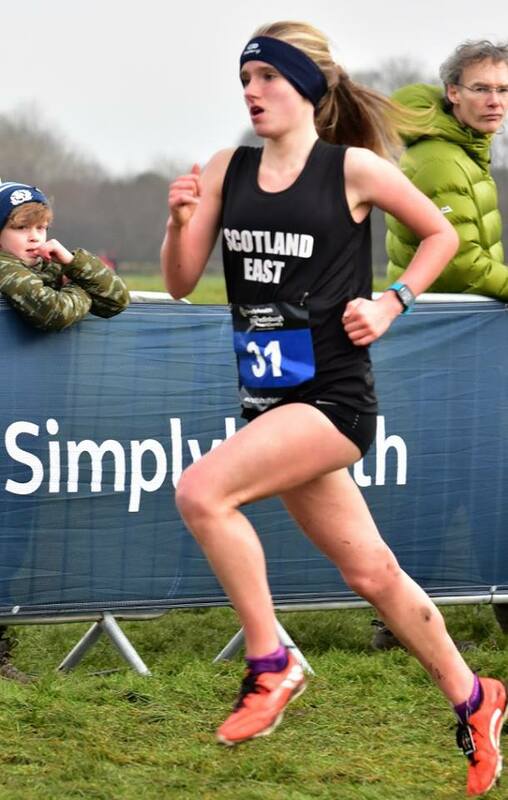 Cera Gemmell of Team East Lothian delivered one of the most impressive runs of the day as she took gold in the U17 race and 13th overall in the Junior Women’s race. The East athlete clocked 14.59 and actually eclipsed no fewer than half a dozen international athletes. West sisters Lynn and Charlotte McKenna were second and third – but the East still took the team golds by a couple of points!